Justice Minister Shaked says Israel won't release recaptured 'Shalit deal' terrorists as precondition to return of IDF soldiers, civilians. 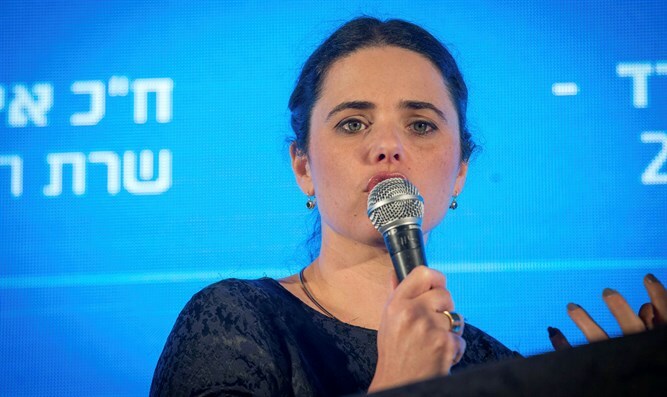 Justice Minister Ayelet Shaked (Jewish Home) on Wednesday morning participated in a conference held by the Lobby to Bring the Soldiers Home. IDF soldiers Hadar Goldin and Oron Shaul were killed during a UN-initiated "ceasefire" during 2014's Operation Protective Edge. Hamas has held their bodies since then, in hopes of exchanging them for terrorists. Two Israeli civilians who went missing in Gaza - Avera Mengistu and Hisham al-Sayed - and are believed to be held by Hamas as well. "I agree that due to the situation in Gaza, we have an opportunity now to bring our soldiers and citizens home," Shaked said. "The Diplomatic-Security Cabinet is discussing the issue." However, Shaked also said Israel will not agree to Hamas' precondition of releasing convicted terrorists. "We need to say that we do not agree to Hamas' offer requiring that we release recaptured 'Shalit deal' terrorists as a precondition to negotiations."